Get great fitness and nutrition tips. I have been in fitness for over 20 years and I have seen and heard every EXCUSE in the book. How Can I Start Working Out If I'm Out of Shape? Learn how to get fit from your chair with Donovan Green. 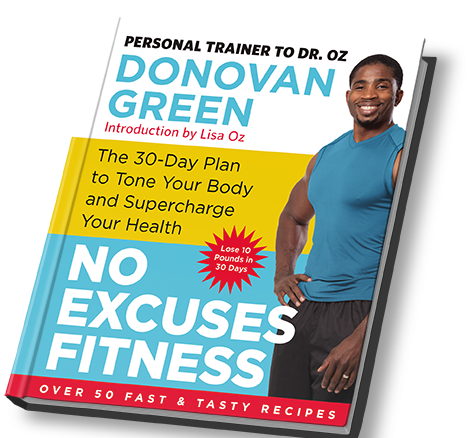 Donovan Green is the author of No Excuses Fitness, a graduate of the Institute of Integrative Nutrition and a certified ACE and IFA personal trainer. With over 15 years personal trainer experience and as a sought-after kickboxing instructor, Donovan understands the benefits of a healthy, physical lifestyle and desires to educate others as his teachers did for him. His loyal following has proven he has set the bar in giving clients both an extremely challenging workout while simultaneously evoking excitement, confidence and a desire to be better. Donovan lives by his mantra, “Your body is just a body until you make it a temple.” Don’t be fooled by his genuine kind persona…he is a bulldog when it comes to getting his clients fit and motivated! How can I stay hydrated if I'm physically active? It's important to stay hydrated when you're physically active. In this video, Donovan Green will talk about how much water you should drink daily. How much exercise should I get each week? What is the proper progression of a strength training routine? What can I do to stay fit when I travel? Trainer Donovan Green shares his secrets for calorie-burning success. What can I eat for breakfast that will keep me full for hours? How can I sit less during the day? How do I appreciate a body part I am uncomfortable with? What is the most frustrating body part to tone? How can I increase aerobic fitness? What are the benefits of positive feedback? As a woman, how should I do weight training? Why is fitness more important than weight loss?